collectSPACE - news - "Man offering Apollo parachute arrested"
June 18, 2004 — A museum volunteer whose eBay sale of an Apollo capsule's main recovery parachute lead to his arrest for possession of stolen property, was cleared of all charges earlier this month, according to the district attorney in an interview with the Poughkeepsie Journal. Whether Christopher Rogine of Red Hook, New York will retain ownership of the parachute however, still needs to be settled by an arbitrator, says his lawyer in the Journal. 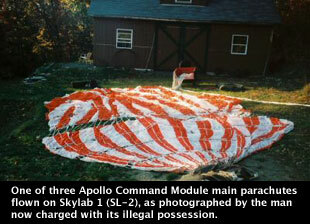 Rogine claimed that the parachute, which flew as part of the 1973 Skylab 1 mission, was gifted to him by the late Cole Palen, founder of the Old Rhinebeck Aerodrome in New York. Palen had in turn received the chute from the Smithsonian's National Air and Space Museum during a visit to swap airplane parts in 1982. With Palen gone however, Rogine was unable to provide documentation supporting the gift. Shortly after Rogine offered the parachute for auction in January, Aerodrome officials alerted the state police as to the possible theft. In the Journal, Rogine said depositions from fellow Aerodrome volunteers along with an inventory list proved he didn't steal the parachute. On an internet forum devoted to World War I aviation, friends and supporters suggested Rogine's arrest was motivated by his falling out of favor with the Aerodrome's current management. For his part, Rogine is upset that the Aerodrome did not contact him first before proceeding with legal charges. "You think they would have come to me and said, 'Chris, where did you get this parachute from? '", said Rogine to the Journal. January 6, 2004 — "I have an Apollo Parachute that I got from the Air & Space Museum many years ago," began an e-mail sent to collectSPACE by Chris Rogine in March 2003. "If you could advise me on what it is worth maybe I would let you handle the sale." The offer seemed too good to be true -- and according to the investigator who had Rogine arrested 10 months later, apparently it was. A volunteer for 18 years at the Old Rhinebeck Aerodrome in New York, Rogine claimed in his e-mail to have been gifted with an Apollo parachute by a friend who was also a museum curator, Rick Vogt. "Cole Palen, the owner of the Aerodrome and Rick went to the Air & Space Museum to swap parts... as Cole had done many times... the museum asked if they would like these two parachutes, because they were going to shred them. Cole got one and Rick got the other," wrote Rogine. "Rick then asked if I wanted it. I said yes." Referencing serial numbers printed on the material with paperwork provided by the Smithsonian, Rogine's chute was identifed as flown on Skylab 1, May 25 through June 22, 1973, for the safe recovery of Charles "Pete" Conrad, Paul Weitz and Joseph Kerwin. "We do have a record of [a main parachute] from the Skylab [SL-2] mission being deaccessioned in August 1980 and a record of its being 'Given' to the 'Old Rhinebeck Aerodrome' (Mr. Cole Palen) in May 1982 over the signature of the then Chairman of the Space Science and Exploration Department," wrote Allan Needell, curator for the National Air and Space Museum, in an e-mailed reply to an inquiry sent by collectSPACE in April 2003. Despite the legal transfer from the Smithsonian, Rogine was unable to show paperwork documenting the gift from the Aerodrome. "I really do not think that anymore official paperwork is going to come from the Aerodrome," wrote Rogine when asked by collectSPACE about documentation. "I received the parachute when Cole Palen was alive. Now after five directors, and lots of turbluence between board members and active crew members, nothing is moving forward." In August 2003, collectSPACE passed on Rogine's offer to sell the parachute. Four months later, the parachute was listed by Rogine for sale on eBay for a minimum bid of $9,500. "The condition is in perfect. No rips, tears or discoloring. Have packaging paperwork," read the auction description. Tipped to the sale by an employee at the National Air and Space Museum, Aerodrome Director Thomas Daly alerted the police to the possible theft of the parachute. Investigator Darren Forbes soon after learned that the parachute was still being listed as part of the Aerodrome's collection. Forbes made contact with eBay, which in turn lead him to Rogine. Forbes also contacted Roger Launius, Chair of the National Air and Space Museum's Space History Division and collectSPACE editor Robert Pearlman for further details about Rogine's offer for the parachute. On December 31, Rogine was arrested and charged with possession of stolen property after he was unable to prove the parachute was transferred to his ownership. He was not charged with theft because the police could not show how the parachute came into Rogine's possession. Rogine is due to appear in court on January 8.